Moreton Fig is a unique USC Hospitality concept located in the Ronald Tutor Campus Center. 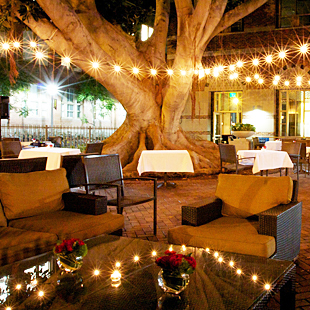 The stylish, vibrant restaurant features an open kitchen, full bar, private dining room, and outdoor patio anchored by USC's historic Moreton Bay Fig Trees. The menu focuses on seasonal and market driven cuisine with options to suit students, faculty, administrators and the public alike. Moreton Fig's private dining room is a sophisticated and elegant private space for your next luncheon, dinner or meeting. Please call 213.821.3441 for more information. Our catering sales team is ready to assist you!